Fill in your Company information and check out. A proof will be emailed in 24-48 hours for your approval. Door hangers WILL NOT BE PRINTED WITHOUT YOUR FINAL APPROVAL. Once approval is given, door hangers will be mailed in 5-7 working days. 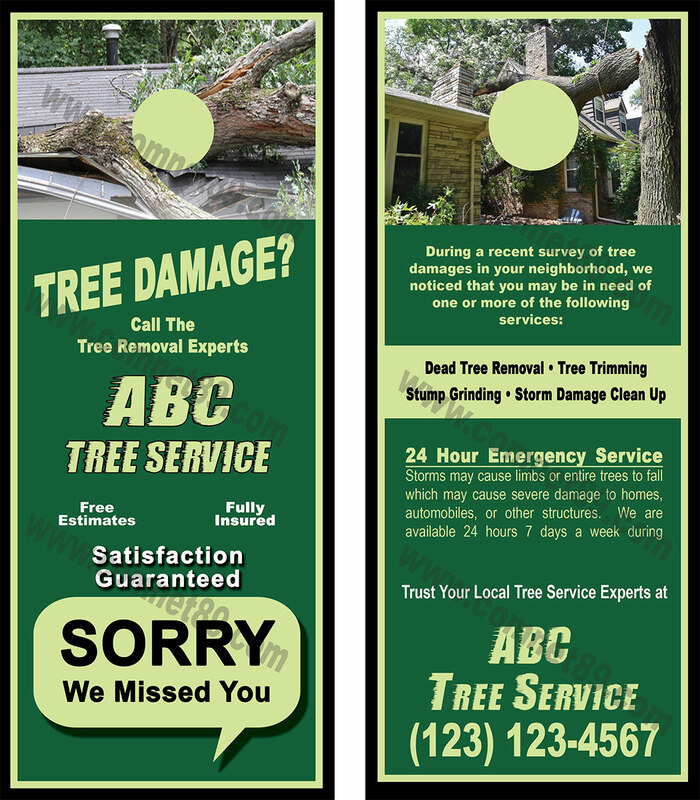 Storm Damage Door Hangers are ideal for Marketing your services to affected communities right at their front door. High-quality, full-color offset door hanger printing available on multiple premium paper stocks and in various sizes. Several coating options are also available. Rip Door Hangers are a resourceful tool for customers passing by your ad. Provide your contact details on the tear-off business card portion and ensure you will be remembered. Design Prices range from $69 - $99 depending on size. Mailing Services are available with Advanced Designer orders.